In Spain one of the national treats are delicious gluten-filled confections called churros. I lived in Spain for 8 months during college, and it was always heart-wrenching to go with my friends to the late-night churros spot in central Madrid and watch them delve into a plate of warm fritters served with piping hot melted chocolate. Lucky for us gluten free L.A. folk there is a fantastic new place serving up gluten free made-to-order churros in Santa Monica. 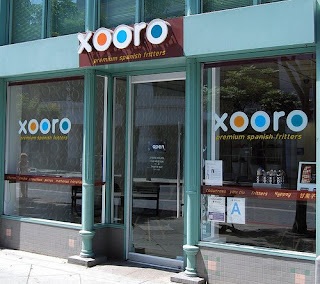 Xooro is a very modern cafe serving up amazing gluten free fritters, hot chocolate, espresso, and ice blended drinks only two blocks from Santa Monica's Third Street Promenade. The best part is that everything on the menu can be made gluten free. I've ordered the Black & White, Jordan's Special, and the Triple Chocolate and loved every single bite of each. The best part about Xooro is the helpful staff. Whenever I visit Xooro the staff is attentive and answers all of my gluten related questions. So go take advantage of the spectacular L.A. weather by ordering some Xooro and bringing your fritters along for a walk on the Third Street Promenade, down to the Santa Monica Pier, or for a stroll on the beach.